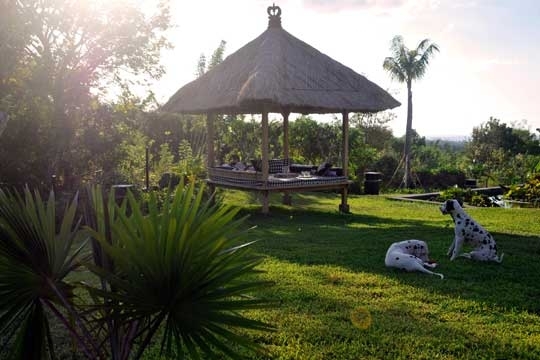 Open-air living, Timorese carvings, a swimming pool, huge gardens and stunning views of the West Bali National Park, the sea, and the volcanoes of East Java, can all be found at Villa Timor. 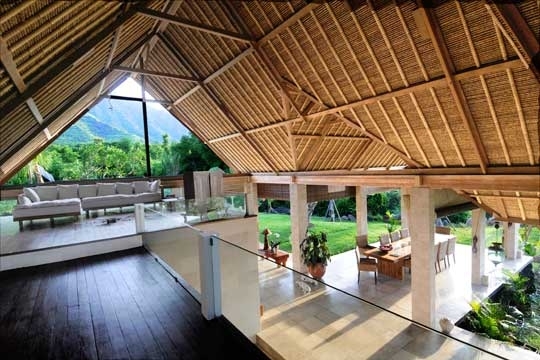 This 2-bedroom, fully staffed property is one of three Jeda Villas at Pemuteran in north-west Bali. It takes a great deal of imagination to fall in love with two-and-a-half hectares of desolate scrubland at Pemuteran on Bali’s arid north-west coast. “You can see the ocean and the mountains from here,” said the land agent to the future owners of what would become the Jeda Villa estate. As the views were hidden by the scrub and seeing nothing but rocks and trees they had to take his word for it and make a leap of faith – and it’s lucky for lovers of northwest Bali that they did. After enduring the clearance of tons of rock, the digging of deep wells, and the creation of underground reservoirs, the land has born the rarest of fruits – a tamed wilderness of rolling lawns and a trio of houses, which overlook the ocean to the front while being framed at the back by the mountainous beauty of the West Bali National Park. 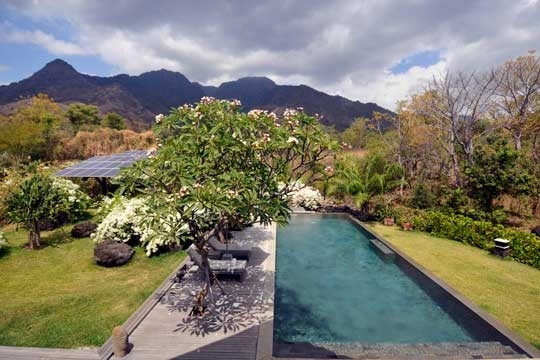 Defined by ornate Timorese hand-carvings on its shuttered glassless windows and doors, the two-bedroom Villa Timor sits in a huge garden, punctuated with trees, a swimming pool and massive volcanic boulders covered in white-flowering bougainvillea. The eco-friendly house comprises a large open-sided pavilion, with two downstairs bedrooms and an upstairs mezzanine, and – like the garden – offers an abundance of space, using its soaring thatched roof and a cool selection of local stone to dramatic effect. 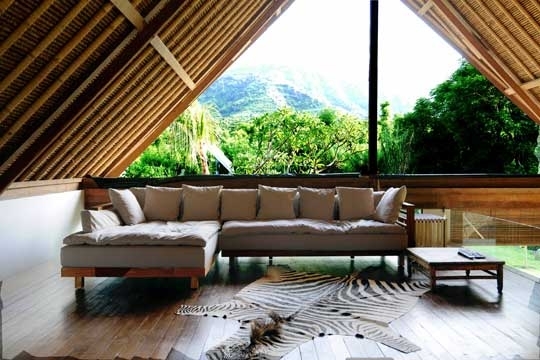 Villa Timor is a chill-out junky’s best ever fix of relaxation and contentment; proof perfect that with a mix of vision and faith, man can move mountains. 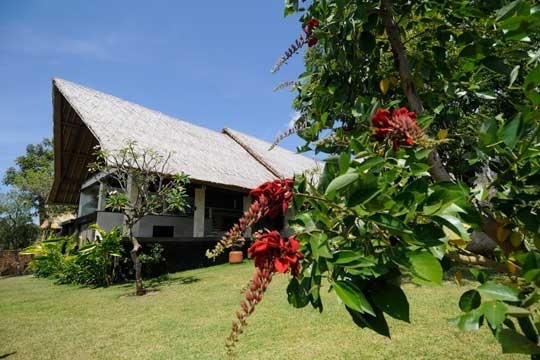 Villa Timor can be rented on its own or in conjunction with one or both of the other two Jeda Villas – Villa Bali and Villa Java (both three-bedroomed) – which collectively offer options ranging from two to eight bedrooms, making the property ideal for groups of friends or families with older children. The location may be a bit remote but with the villa’s shuttle service into and around Pemuteran, you will have the opportunity to check out the local restaurants (all within 2km) and dive centres. On the other hand, with a competent cook shared between the three villas (breakfast is included, other meals are on guest account), a caring team of staff, and a masseur on call, you will be very well looked after at “home”. A chill-out junky’s best ever fix of relaxation and contentment. 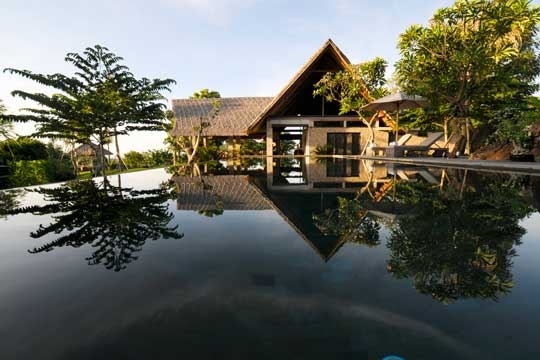 Jeda Villas is set 600m back from Bali’s main northern highway (far enough away not be troubled by the sight or sound of traffic), surrounded by forest, scrubland and very little else, so expect to spend a lot of time within the villa’s massive gardens taking in the views and lying beside the pool. A fun option, however, is to don a pair of sturdy walking shoes, grab a couple of bottles of water and a picnic hamper and head off for a hike into the hills that stretch up behind the villa. The views over the Pemuteran area and across to the volcanic skyline of Java a little ways off to the west make it well worth the effort. The district of Pemuteran lies in the rain shadow of the central range of volcanic mountains isolating it from Bali’s south and making it less humid. The sea is calmer here and swimming is therefore safer than in the south of the island, while the snorkelling and diving locations – which include the nature reserve of Menjangan Island with its incredible coral reefs – rate among the best that Bali has to offer. This district is famous for its artistic heritage and dance tradition. The style of the gold and silver work, together with the weaving, pottery and instrument making are all very distinctive and unique to the area. For hundreds of years this was the part of Bali that was most open to foreign influence, as Chinese and Muslim traders brought their products, religion and culture through the north-coast port of Singaraja. The incredible variety of the countryside makes this historical area diverse, interesting and delightful, a real contrast to the other parts of the island and well worth a visit. Pemuteran is also a good base for visiting the beautiful forested West Bali National Park. In Pemuteran village, you will find a string of restaurants – recommended ones include Frangipani, Taman Seline, Puri Ganesha (reservations essential), and Matahari (expensive) – hotels and dive centres along the main road. 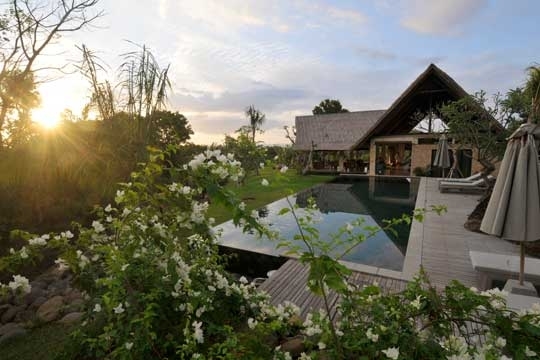 The beautiful Villa Timor is designed to catch the sea breezes, open on three sides, with a heavy carved Timorese front door and a soaring thatched roof supported by traditional coralline limestone pillars. Not to be outdone, the dining area is open on all four sides, extending out on a limb under its own section of pitched thatched roof, and furnished with a solid wood table that comfortably seats eight. There are two sitting areas within the downstairs space too; one is furnished with a huge L-shaped sofa, with lime green cushions, blessed with views of the garden and the sea in the distance, while in the other is a black leather sofa and cow-skin ottoman with a view of the pool against the dramatic backdrop of the mountains. 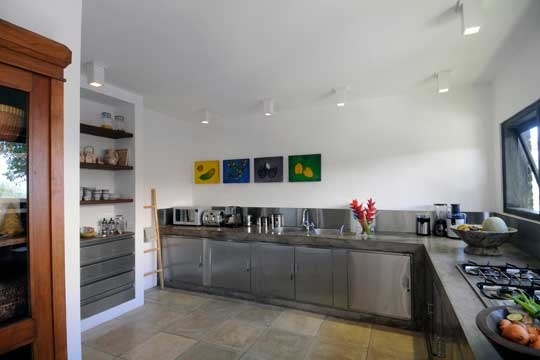 A well equipped kitchen, suitable for self-catering, is positioned to one side. 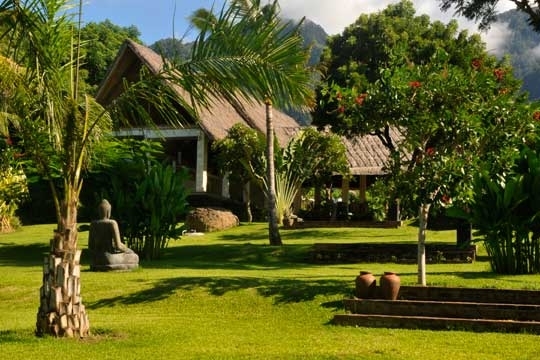 There is no glass at Villa Timor; the windows are open portals, shielded by pivoted wooden shutters adorned with Timorese hand-carvings featuring traditional patterns, primitive figures and animals. Doors and wardrobes follow the same theme. On the ground floor, the master bedroom boasts mountain views from its queen-sized bed and offers the choice of a ceiling fan or air-conditioning. 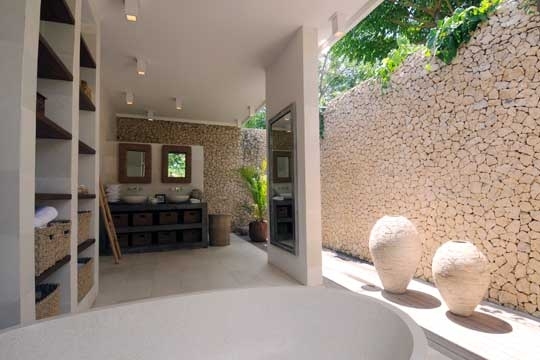 The semi-open-air ensuite bathroom, with walls of random rock and rough tumble marble, is fitted with twin washbowls, a monsoon shower, and a bathtub for two next to another pair of shutters that can be thrown open, once more, to that glorious vista. 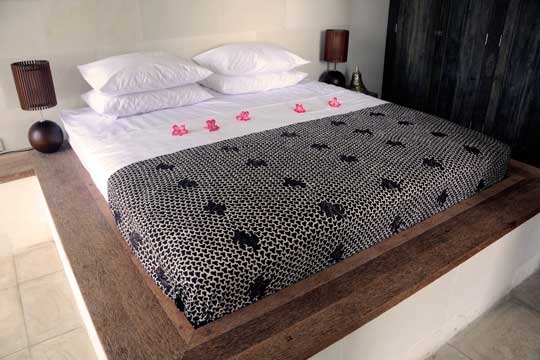 The guest bedroom is similar but smaller, furnished with a queen-size bed, and with windows open to the sea view. The ensuite bathroom here is the same as the master’s but without the tub. From ground level, stairs lead up to a timber-floored mezzanine where a breezy office space boasting views of the sea and the volcanoes of East Java is furnished with an antique desk and a heavy 17th century Dutch safe. A level above, built-in shelves are filled with books and DVDs. From here, a single step leads up to a cosy area furnished with a sofa and a 40-inch screen for watching DVDs. Timor’s 4000sqm garden is dotted with ancient frangipanis, flame, neem and cockscomb trees, a lotus pond, Buddha statue and balé relaxation pavilion. The 15m pool faces the mountains and is bordered by a timber deck furnished with sunloungers and umbrellas. 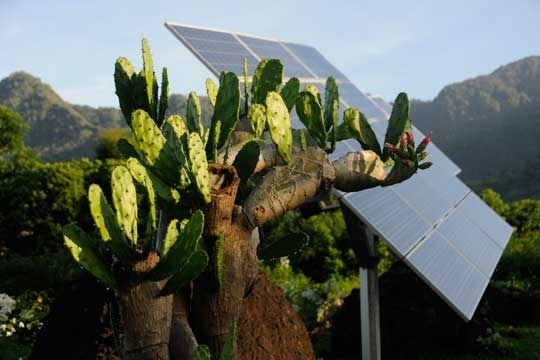 Hidden behind is a volcanic garden, a plantation of coral fountain flowers, a cluster of solar panels and a tiered seating area offering the best views of all. 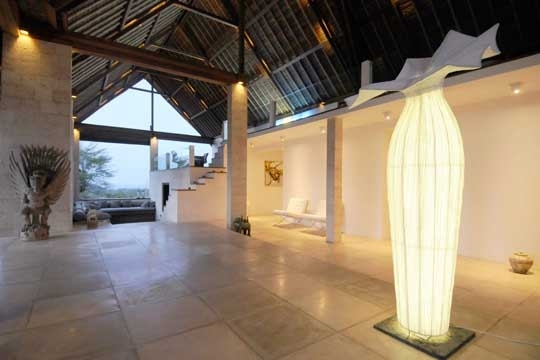 2 bedroom villa located in Pemuteran, Bali. Ideal for Beach in ten, Body and soul, Eco aware, Fair share for groups, The great outdoors, Romantic retreats, Sensible for seniors, Room with a view.